California is in the middle of a multiyear, perhaps decades long drought. Governor Jerry Brown is imposing the first mandatory water conservation restrictions ever for the state. The Sierra Nevada snowpack, from which a third of the state gets its water, is at 5% of normal after a nearly snowless winter. This is a shame for the county's most populous and biggest agricultural state. More water in California is used for irrigation than for any other purpose. However, in the large urban areas in southern and central California, water is primarily used directly by people. Over 37 million Californians (over ten percent of the country) have been affected by the drought. Those who like to garden or landscape have likely been more affected by this drought - with no end in sight. So, what is the plant lover to do without sufficient water? The answer is to use water more intelligently, and to do this by using the Groasis Waterboxx. Most water poured into the soil is not directly used by the plant. It either flows away through the soil or evaporates into the air (especially in hotter climates). There are multiple techniques to prevent these losses (planting in containers, using mulch) but these have serious drawbacks (cost, easy drying out of roots, poor evaporation blocking ability of mulch). The Groasis Waterboxx deals with all of these issues, as explained below. The Groasis Waterboxx was initially designed to plant and grow trees in the desert, with water only added at planting. In this it has been remarkably successful. In a Saharan Desert planting trial, single trees planted with the Waterboxx had 88% one year survival (vs. 11% survival for trees watered once weekly but without the Waterboxx). The survival rate for at least one tree increased to 99% when two trees were planted in the Waterboxx as intended. When planting a tree with the Waterboxx, 10 gallons is poured into the soil before planting, the bare root tree is planted, and then the Waterboxx is filled with 4 gallons of water. No water ever again needs to be added as the Waterboxx collects dew and rain water and slowly releases it to the growing plant through a wick in the base of the Waterboxx. The Waterboxx is left in place until the tree outgrows it and can be reused for up to ten years. The Waterboxx planted tree is then resistant to drought because of its deep, capillary water fed roots. What about gardening? Well the Waterboxx can be used to grow many fruits and vegetables as well. Generally, since vegetables require more water than trees, we recommend inserting a second wick into the base of the Waterboxx for water loving garden plants. If this is done, water generally needs to be added to the Waterboxx every 3-4 weeks - again 4 gallons. However, as the Waterboxx prevents evaporation of soil moisture immediately beneath it (by acting as a type of impermeable evaporation barrier, a far better alternative to mulch), the roots of the plant won't dry out. Below you can see results of a customer growing tomatoes with the Waterboxx (with extra wicks inserted) in Hemet, California in late 2014. Can the Waterboxx also be used to grow greens rather than traditional vegetables? Yes. 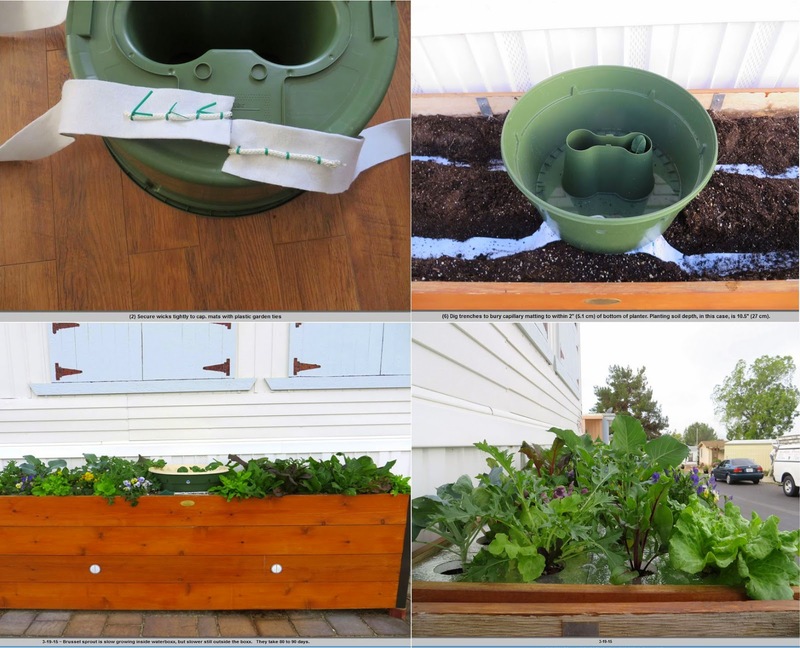 The same avid gardener in California ingeniously found a way to extend the reach of the Waterboxx by adding 3 extra wicks, adding water permeable material to each of the wicks and then spreading these out into the soil raised bed. The gardener then planted 27 greens on either side of the Waterboxx, and placed a evaporation cover over them as they began to grow. The customer found that the greens grow great with only 2.5 to 3 gallons of Water per week (all poured into the Waterboxx), and no need for overhead watering. He is able to enjoy fresh greens every day now. If you want to start gardening with the Waterboxx (or growing trees), please visit our main website, www.dewharvest.com. There you will be able to see many other garden plants growing with the Waterboxx, including zucchini, cucumbers, watermelon, pumpkin and eggplant. 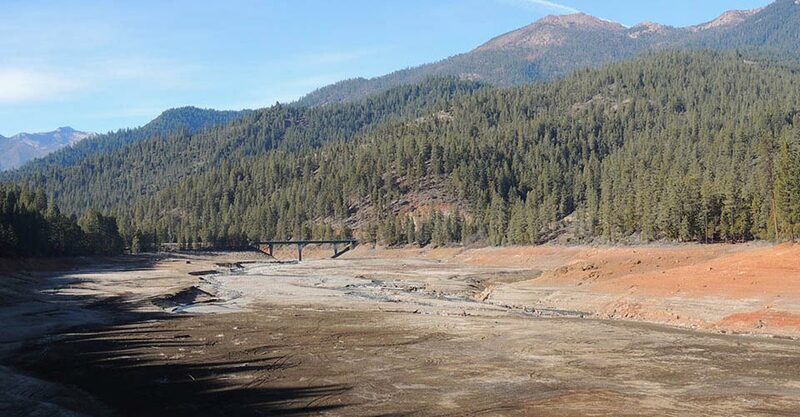 Photo by: Tim Reed, USGS California Water Science Center Supervisory Hydrologist; taken February 4, 2014.